Hi, This is Jackie from Ready. Set. Read! 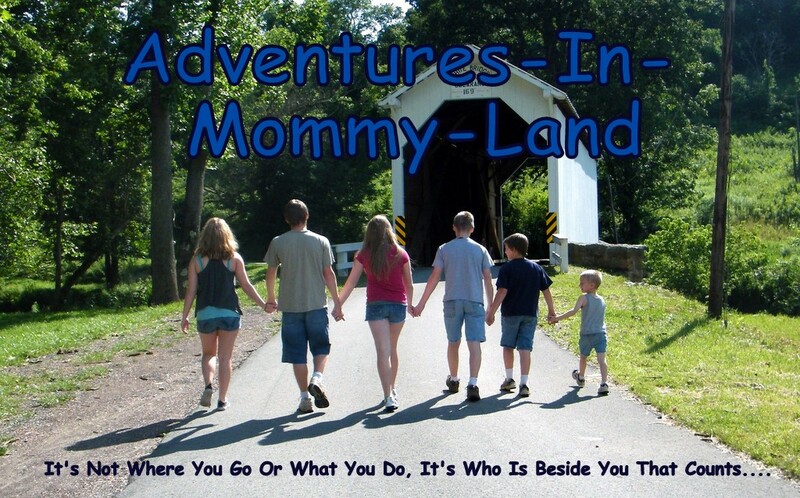 Thank you so much to Charlene for inviting me to post at Adventures-In-Mommy-Land! I am always so inspired by her adorable crafts for kids and thrilled that she invited me to share one this week during the book/craft feature. One of my favorite Christmas books is The Night Before Christmas by Clement C. Moore Illustrated by Mary Engelbreit . The text of this book follows the classic poem written by Moore in the 1800s. The story of a family settling down for the night in anticipation of Santa Claus's arrival is also beautifully told through Mary Engelbreit's illustrations. Mary Engelbreit is from my home city of St. Louis. (I live outside of the city but I cheer for the "hometown" when it comes to amazing illustrators and world series champions! Go Cards!) The illustrations are so detailed, yet there is a large illustration on each page that grabs your attention. This makes the book great for mulitple ages. My (almost) 2 year old adores her rosy cheeked Santa. We made a Santa craft to go with this book. I saw this Santa at a gift shop in Branson, MO this summer and I knew I wanted to try and make one. This is definitely a craft that the boys and I had to work on together and it does require a little bit of work to get it ready. It's so cute, though, I thought it was worth it. You will need red circles (sizes), black circles, a red small ornament, paint, a jingle bell, a yellow button, and a ribbon. (2) I snipped the felt circles with an X to make it easier for my three year old to thread. 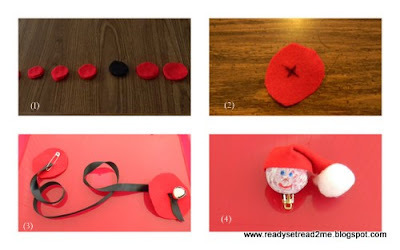 (3)I threaded a jingle bell onto a piece of felt to keep the pieces from falling off. And attached a safety pin for easy threading. (4) Now create a Santa head. I used a red ornament that I turned upside down. I created a very simple face by painting it white and then painting on a simple face. I cut a triangle out of felt and glued to the top of Santa's head, folded it down, and glued on a cotton ball. Some older kids may be able to do some of the preparation work on this craft. I have preschoolers so I had to do all of the prep work. Then I gave Logan (my three year old) each size of circle and he threaded them from largest to smallest. He absolutely loved this craft. We sat and talked about who he wanted to give his ornament to. It was a great quiet time activity. Now our cute Santa has a prized place on our Christmas tree, ready for Christmas eve. If you would like more book and craft ideas like this, I'd love to invite you to check out the 12 Days of Christmas at Ready. Set. Read! This is so cute and the boys are too. So cute! Jackie always has great ideas! Thanks for the tutorial! This little ornament is cute!